Swirl worked by using spiral shaped hands connected to an analogue movement which converted radial movement to linia movement. Allowing the time to be display in a column like window. 3Delix takes this concept into the third dimension. The time is told by two (or three if seconds are required) helix shaped hands (like a single coiled spring) The hands are connected to a small diameter analogue movement which is mounted horizontally rather than vertically. The hands rotate around a tube with markings on it. The coil moves up the tube as the hand rotates. The markings could as easily be on the glass or printed on a transparent tube around the outside of the hands. This design has an alien look which may apeal to sci-fi lovers, the simple mechanism but complicated look combined with analogue technology should appeal to those who hanker for high end horology. This entry was posted in Design Submissions, Watch Designs and tagged alien, Analog, Bracelet, futuristic, Mechanical, Product Design, sci-fi watch, unisex, Watch Design Submission. Bookmark the permalink. ← Graphikal watch graphs out the time. Can you imagine wearing this & the reactions you would get? People would be amazed. It’s an odd fusion of sci-fi and analogue; with its almost spacecraft styling and laboratory readout, but it really works for me. It’s a pleasure looking over this design & I really want to own it. Thanks a lot for posting and commenting Toky! Im glad it floats your boat. Its really quite a simple idea (and hopefully on the feasible side) but could look high end if done well. Definitely a competition to other non-traditional mechanical movement watches on earth. The mechanism is so simple and the result is so cool – just great! Very cool Pete , I would love to wear it! Been waiting for this one to arrive. This is a stunning design and must be made! This is a weekend watch for me, as it isn’t really possible to get accuracy for the minutes in the office, but that’s probably when I’d want to wear it anyway. Don’t think there’s any point adding a seconds hand – it would clutter up a very clean design. If TF make this, I’ll snap one up straight away, although I will have a challenge deciding which colour to go for (so may take a few minutes) – all of you colour / strap combinations are fantastic, as always. 5* doesn’t seem enough for this one. Hi Pete, it is a watch amazing with a very special look. The reading of the minutes alone is a little random, but it is also not a watch to work in the company of railways. 5 * and Yes, great job! I think these mechanical marvels are your best designs, Pete. Very cool looking! The mechanical elegance of the movement & organic beauty of the bracelet demonstrates an evolution in analogue wrist watch design. Great Work Pete & course another 5 star vote. A small suggestion to aid readability: a thin vertical line between the two digits would probably make it easier to tell the exactish time without messing up the look. Hi Anders, cheers for the feedback sir! This is a fantastic design and extremely creative way to tell time. I love the sleek yet fluid shape of the watch’s exterior, I’d buy this watch just for it’s amazing aesthetics. However, I do have some gripes with the interior time telling mechanism. The colors and somewhat busy design in the interior don’t really match the watch’s sleek and fluid exterior. It is also a little hard to gauge the exact time at first glance with the current iteration of the time telling mechanism. I think both of these issues could be solved if the interior’s design were to be re-thought out. Aside from that, this is a truly exceptional and outstanding design which was beautifully rendered. It would be silly for Tokyoflash not to move forward with this design. Well done! I’m really looking forward to seeing how this design gets improved, it sounds like you have some great ideas in mind already. Forgive me for presenting my own idea, but I just couldn’t resist sharing. I had, what I thought was, a clever idea for how this design could help show the exact time while still using a simple helix; lasers and tonic water (In case you’ve never seen the effect a laser has when passing through tonic water: http://blog.everydayscientist.com/wp-content/uploads/TIR-quinine.jpg). Going along with your idea of transparent tubes, a laser could shine through one or both sides of the tube and illuminate the entire tube. Now I’m not an expert on how light refracts within different materials and through different geometries, but I’d imagine that the tube could be designed so that there are small indentations on the sides which would allow light to escape the tube at a tangent, producing a small beam of light. Align enough of these indentations correctly, probably 12 for every hour, and the visual effect of DNA’s strands beaming outward from the tube could be produced. These lasers could shine on different indicators on the surface or the interior which would tell you the near-exact time. This is, of course, a more trial and error intensive design that would require a moving interior that is water tight. However, I haven’t seen any watch use the effect of lasers passing through tonic water and the visual effect produced would be truly unique. Cheers for the thoughts and suggestions. 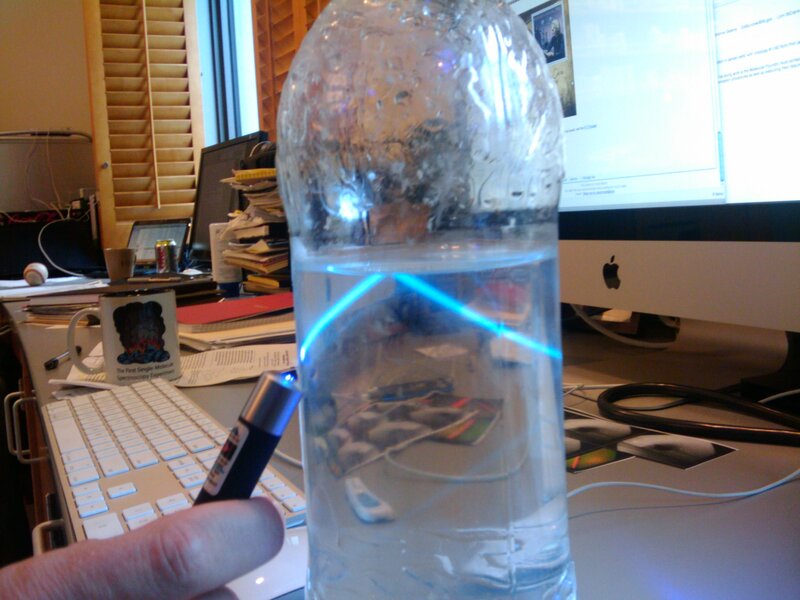 The refracting laser idea would be uber cool! and very unique, certainly in the watch world I imagine. The only issue I would see is that I could imagine this being technically challenging and presumably expensive. By far my favorite with that theme! I like the flat bottom & ^ top (case). I love that it look like it can be opened to switch the tube! I like the 8th picture color (blueish silver). I like the last pic, but would prefer to either have it more rusted/damaged or plain gold (like the animation). Choosing the color would be hard, other than I don’t like all black/2-tone of gray because the lines between 2 links, on both side & around the display doesn’t pop-out enough! Time is running out for this concept soon so I just want to say a big thank you to TF for posting it here and everyone who took the time to vote, comment, share and like!